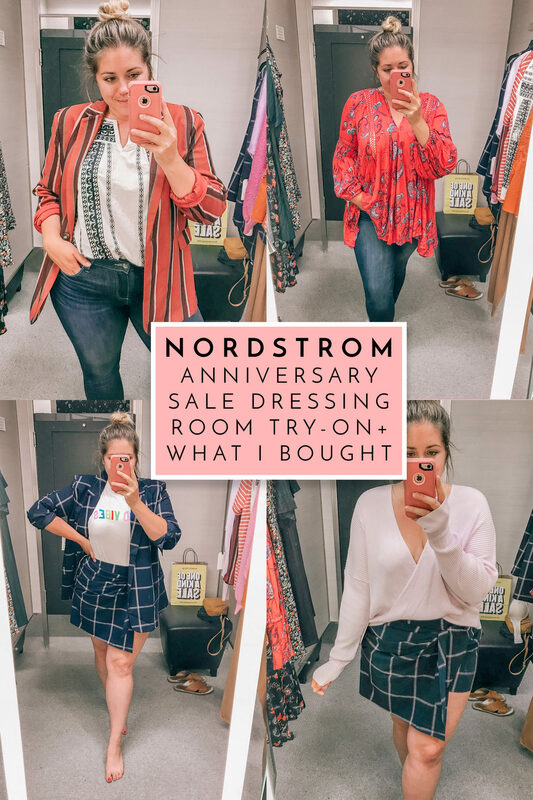 I’ve never written this type of post before, but I thought I’d share pictures of everything that I tried on from the first day of the Nordstrom Anniversary Sale! So many bloggers do this, but I feel like all of the ones that I see, the girl is a size small. 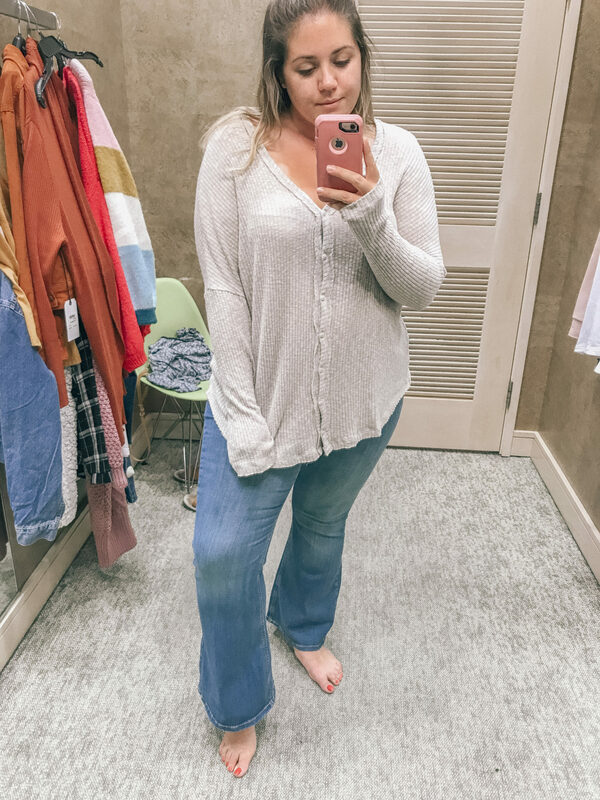 I’m obviously not a size small, and it’s something I’ve always been self conscious of, especially in the fashion blogging world. But I’ve been learning to embrace the body I’ve been given and am also being more adventurous with how I dress it. 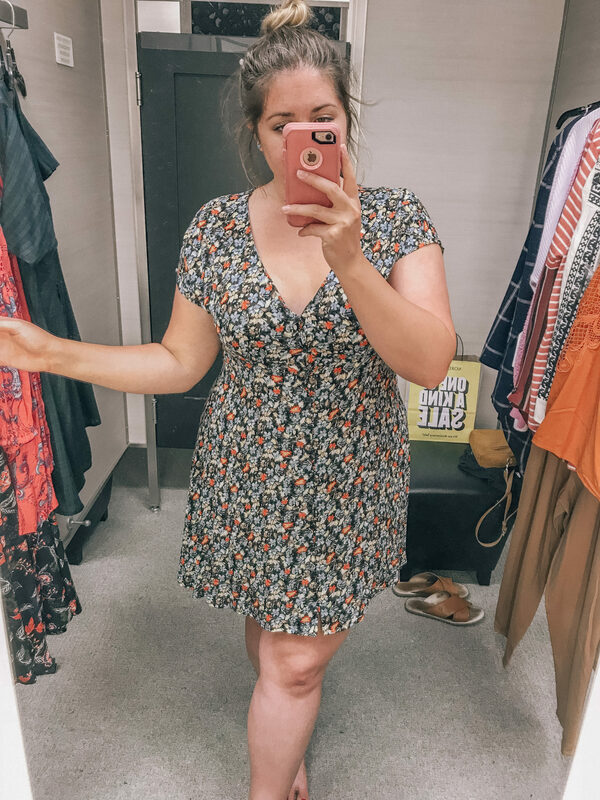 In this post, I’m going to share all of the pieces that I tried on and talk sizing (for reference, I’m usually a size XL/14). Side note: if you don’t know, “tts” means true to size! 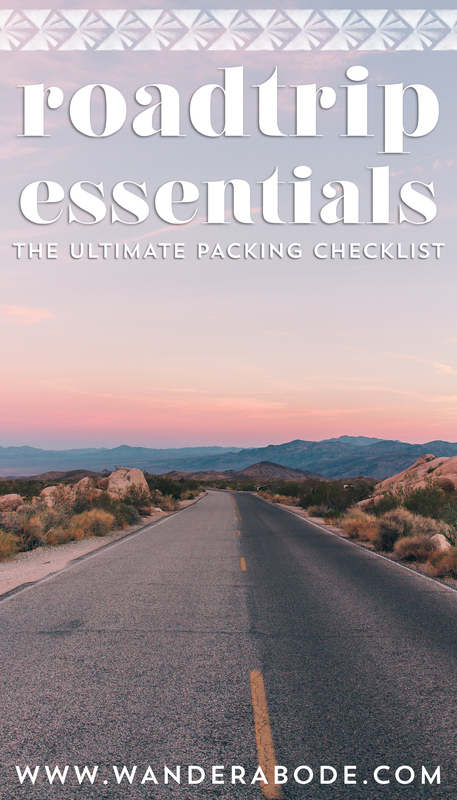 One thing to keep in mind when shopping the #NSale is that a lot of times certain pieces will go out of stock, but they usually restock most of the items throughout the sale, so you need to check back periodically if there’s something you really want! 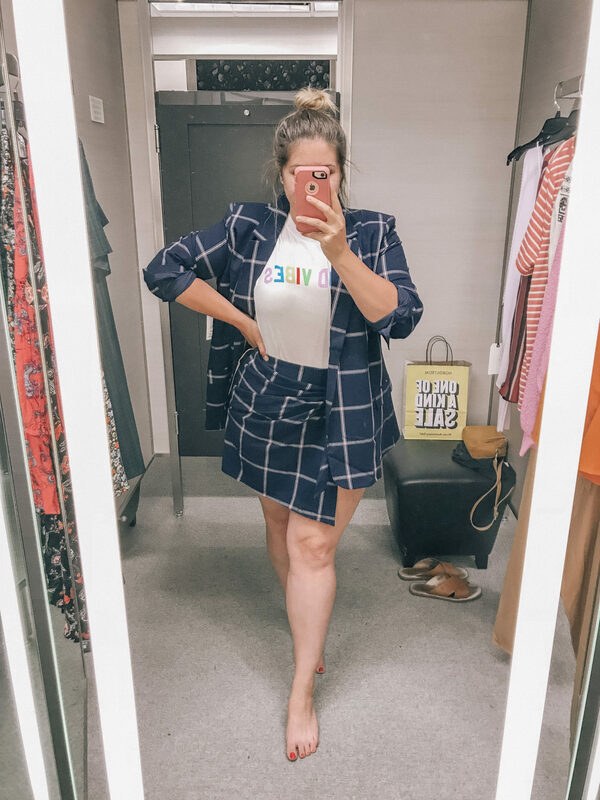 This blazer & skort set is unlike anything in my closet, but when I put it on, it made me feel so confident. The total for this outfit was about $100, which I usually don’t spend on clothes (I have an issue spending over $40 on anything). Even though I probably could have fit into a size XL in both of these pieces, I felt a little more comfortable in an XXL. I also love the look of an oversized blazer. I feel like it looks more “cool girl” and slightly more chic & effortless. I also bought this blush baker boy cap, which I’m definitely going to style with these two pieces! I’m also wearing these Paige jeans which I was OBSESSED with! 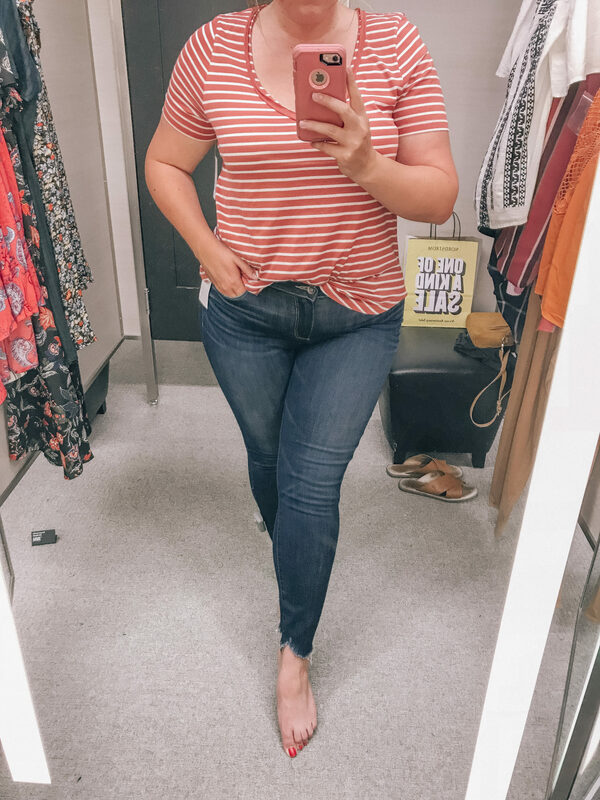 They were insanely comfy, the perfect dark wash, and I loved the uneven raw hem. They were way too expensive for my budget, but if you’re into investing in quality jeans, definitely try these out. There’s also several pairs of Paige jeans in the Anniversary Sale which you can shop HERE! 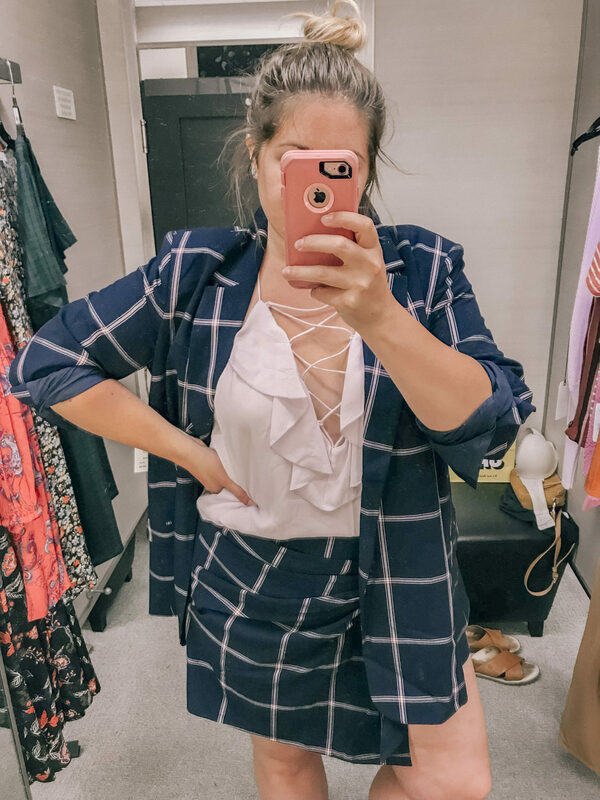 I wanted to style this blazer & skort set with a little bit of a nicer blouse for a dressier look, and love how this outfit looks with the ruffle cami. This obviously isn’t work appropriate, but would be so cute for a date night, cocktail party, etc. I’m also OBSESSED with this sweater & skort combo!! 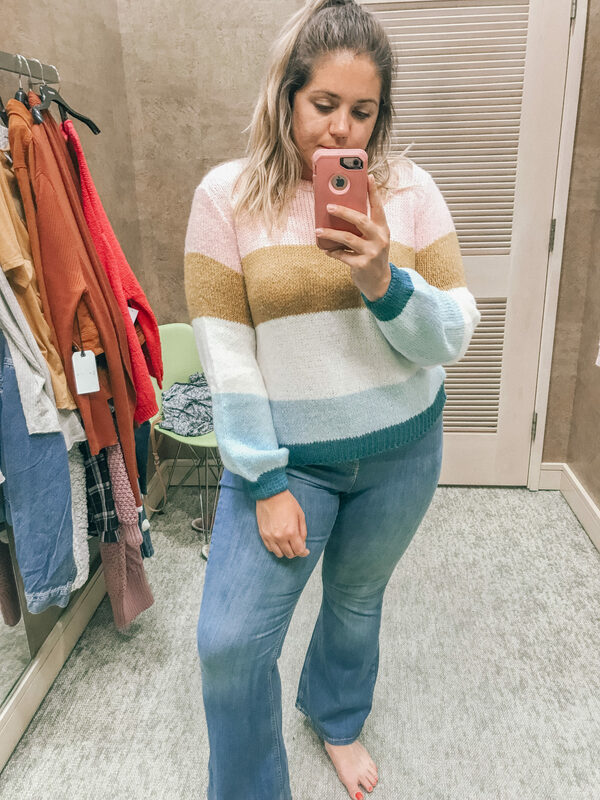 If I buy anything else from the sale, it will probably be this cozy sweater. It would also be perfect with jeans or some nicer pants, or you could even wear it now with a denim skirt or shorts! It also comes in 4 other colors, and I feel like the black or white would be a great staple piece. Okay, I’m not usually a blazer kinda gal, but this is another great one!! I LOVE the colors because they’re perfect for both Summer & Fall. 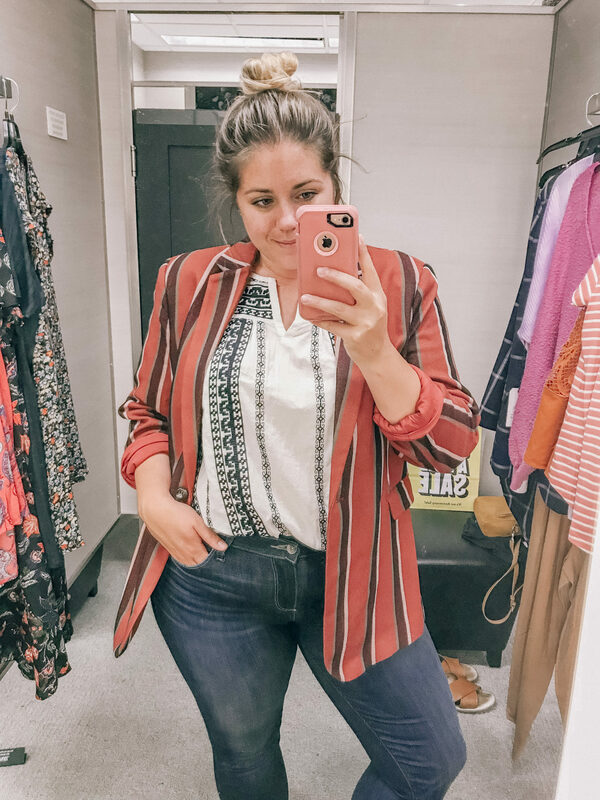 If it’s not super hot, you could totally wear this blazer now with a graphic tee & cutoff shorts. It also comes in navy if you want a bit more of a preppy look. You can see the blouse on by itself below! 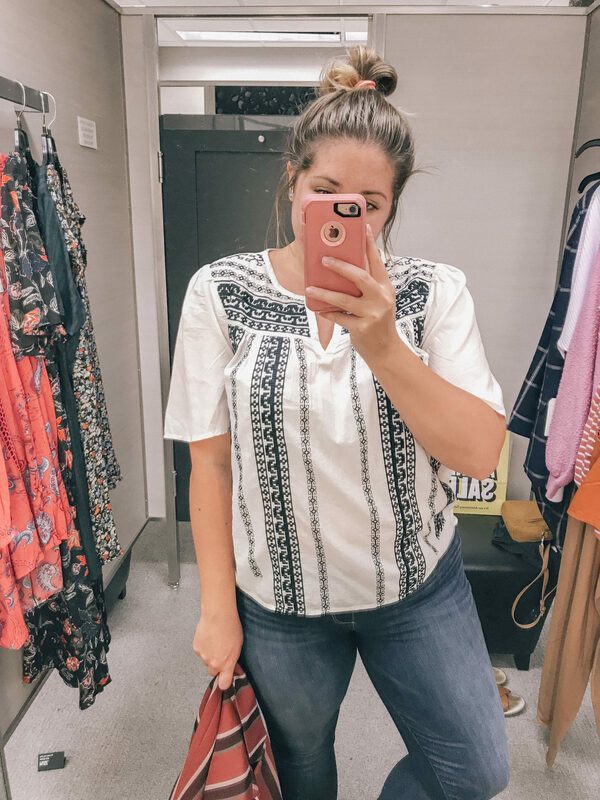 I’m a sucker for this type of boho embroidery right now, and I feel like this blouse could work any time of year since it’s black & white. This is the sweater that everyone has been FREAKING OUT about! It’s unfortunately sold out at the moment, but I’m guessing they’ll bring it back when the sale goes public on Thursday! The colors are so gorgeous and feminine and I feel like they also match the vibe of everyone’s IG filters lately 😂 I’m wearing a 12 which they say fits like a 14, and it definitely does fit, but not like how they show it on the model online (I think it’s supposed to be a more oversized fit). 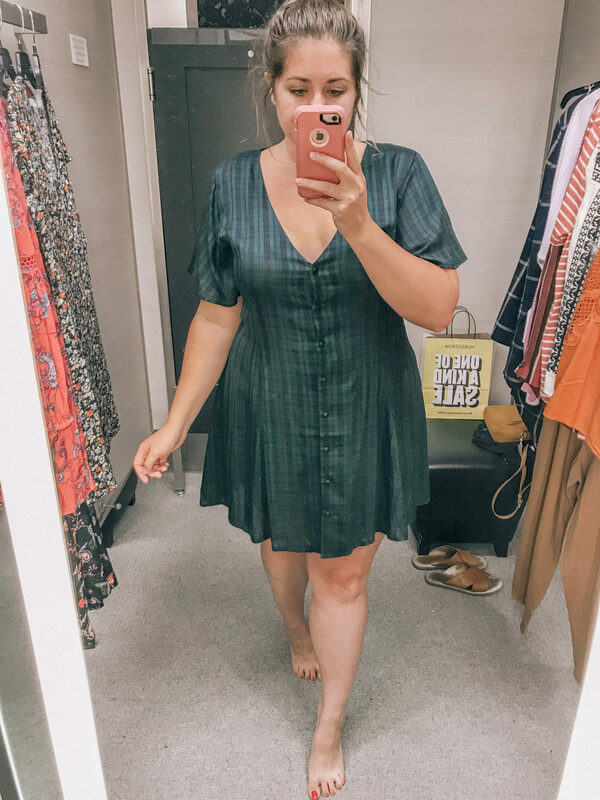 If it did fit looser, I totally would have bought it because I’m obsessed. This tank is another great piece that you can wear now in the warmer months and layer over it when the weather gets cooler! It would look so cute with a cardigan and some over-the-knee boots. There’s not much to say about this dress except that it’s so easy & versatile! You can wear it now with sandals or wedges, or with a cardigan & over-the-knee boots in the Fall! I liked this dress a lot more when I first saw it on the hanger, but once I put it on, it wasn’t totally my style. This would be great if your style is a little more classic/preppy, and it would also be great for the holidays! This sweater is another piece that everyone has been posting about, and although I think the idea is cute, I don’t know if it was really made properly. It could just be that I should have tried on a smaller size, but I think it’s just too bulky & too much fabric. 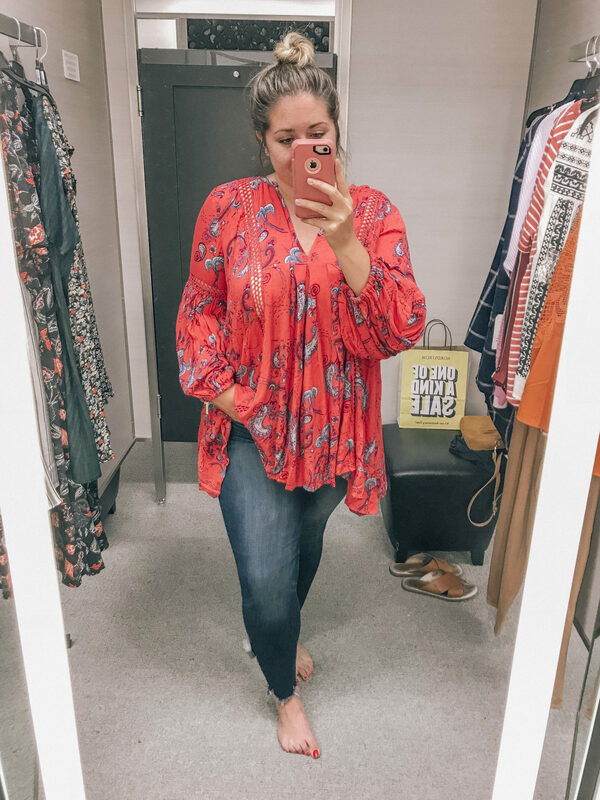 So if you’re going to try this on or buy it online, definitely size down! 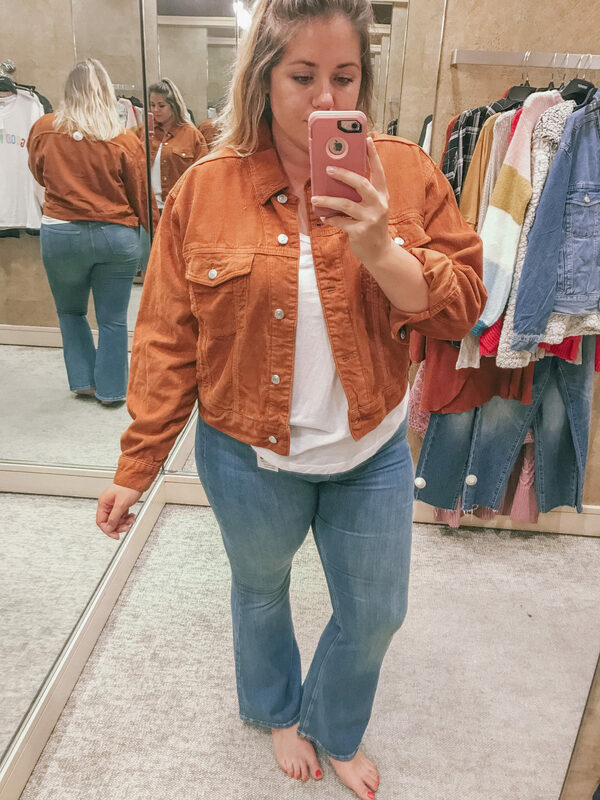 I LOVE this corduroy jacket!! 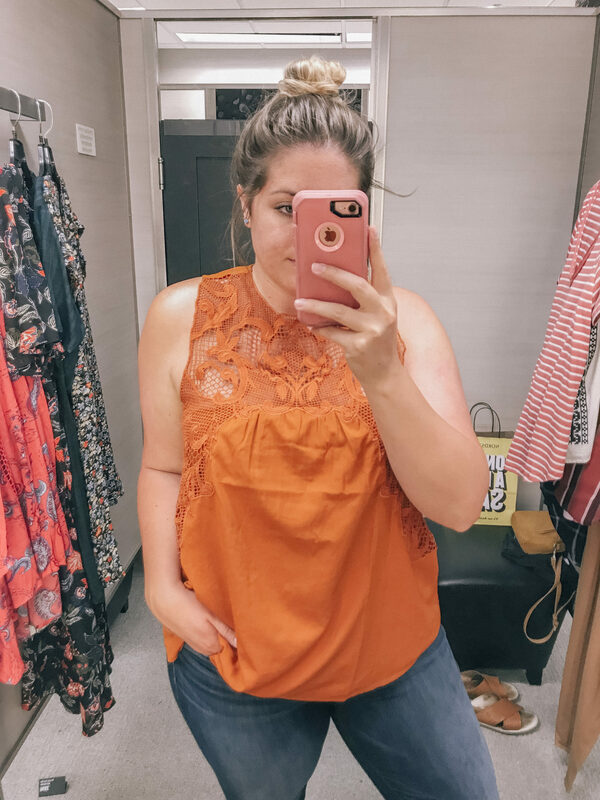 This rust color is so in for Fall, and I feel like if I bought it I would wear it all the time (maybe that means I should buy it…? 🙈) They have a couple other pieces in this rust corduroy: these cropped wide leg trousers & mini skirt. 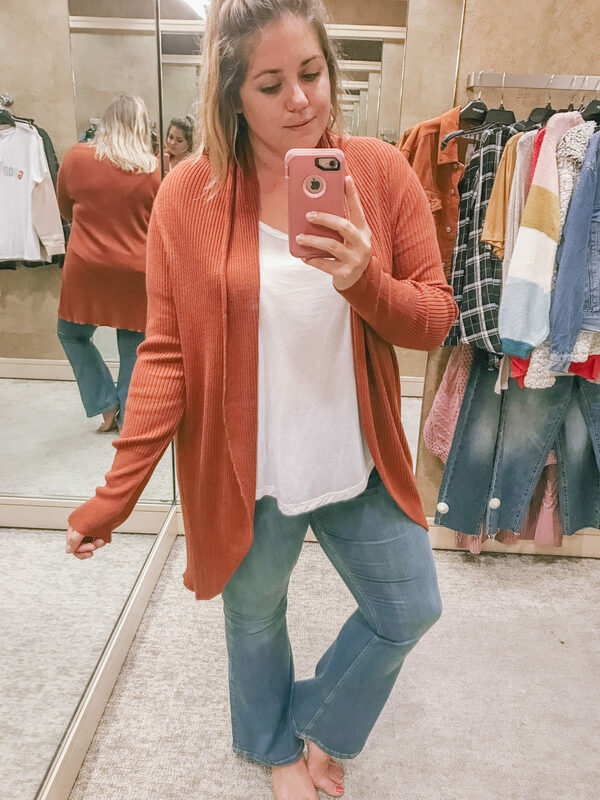 Like I mentioned, rust is a huge color for Fall, so I love this easy cardigan! It’s perfect to throw on with a t-shirt & jeans, or even with a black dress. It also comes in 4 other colors–I also love the blush! 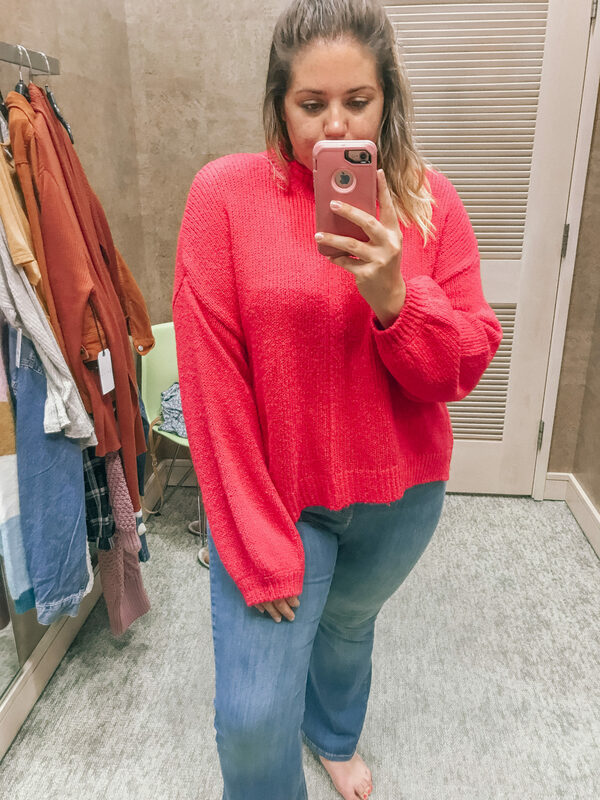 Loving this bright oversized sweater! It would obviously be perfect with jeans & boots, but I can totally see it with a black leather skirt! 😍 It also comes in white & green, but it looks like those are sold out at the moment. Keep an eye out for those to come back in stock though! 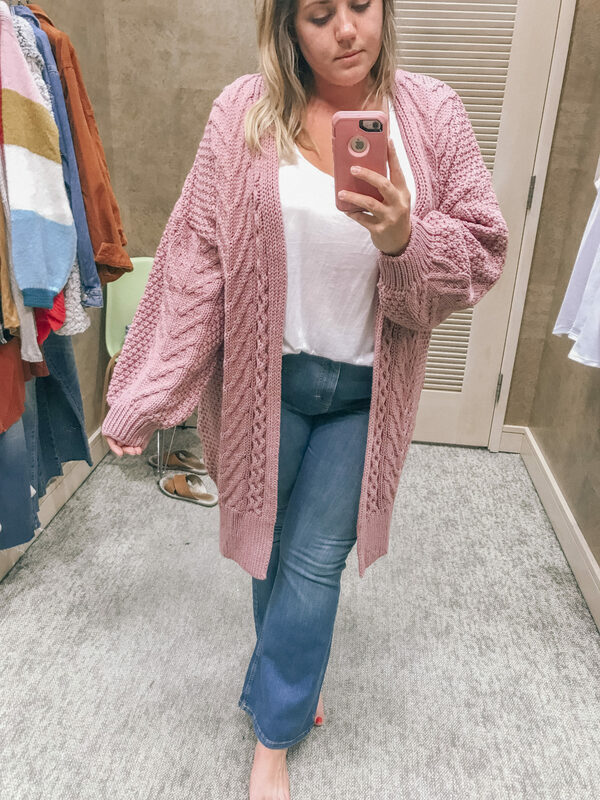 I’m loving this cozy cardigan! You can wear it buttoned up like I am here, or open with a tank or tee underneath. 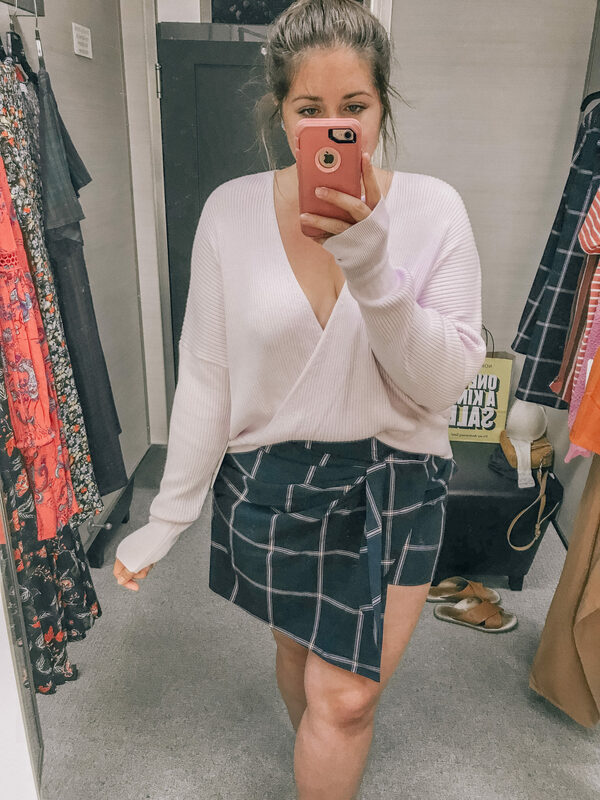 I went up one size for a more oversized look because I’d rather have comfy cozy pieces like this be more loose-fitting. That’s it for now! I’ll honestly probably do a little more shopping the sale in the next couple weeks, so keep an eye out on my Instagram for those pics!